Affordable Accoutrements: If Dinnerware Could Dance! The dishes were a gift from a neighbor who was downsizing and moving to Florida. They've been wrapped in newsprint and packed away in a tote for months. I've struggled to decide how I could use them in a tablescape post. Mid-century modern isn't my favorite design period. There, I've said it, and I know it makes me hopelessly uncool. But it was more than that; the pattern's design says one thing, while the muted tones and brown leaves say another. Colorful flower arrangements seemed too bright. Dried flowers and leaves seemed not summery enough. Another issue for me is that most of the stemware and flatware in my "arsenal" is too formal. Then I found some sturdy, handsome (I think) brown glassware at Goodwill (99 cents per stem!). Things began to fall in place, and the table below is the result. I used clear glass single candleholders and pressed glass tealight holders. I can't give up sparkle entirely, and I didn't want the silverplated flatware to be the only shiny thing on the table. The taper candles are by Colonial Candles. Where else do you turn when you need to match the color of the sliced cantaloupe on your dinnerware? The “Tampico” pattern was part of the “Futura” line of dinnerware introduced by the Red Wing company in the mid-1950s. The pattern was designed by Charles Murphy and won top prize at the National China, Pottery and Glass show in 1956. The original advertising blurb for Tampico [as shown in Ray Reiss’ identification guide to Red Wing Dinnerware] says it creates a fiesta-like atmosphere and is perfect “whether you’re serving burgers backyard style or snacking on TV trays. A great conversation starter for today’s garden party!" The Futura Tampico pattern was also advertised as the “new south of the border look” in dinnerware. Like all Red Wing dinnerware, Tampico is oven proof, hand painted, and sealed by the glaze to keep each piece color fast. Red Wing Pottery had its origins in the rich clay found in Red Wing, Minnesota, in the early 1860's. The company would make its official debut in 1877 as the Red Wing Stoneware Company. Over the next 90 years, the company would have six incarnations with the last being named Red Wing Potteries. The flatware is "Leilani" by 1847 Rogers Brothers. The pattern was produced from 1961-68. A brochure states that "It's fiesta time every time you dine on this exciting new Red Wing dinnerware, hand-painted in rich browns, greens and vivacious melon accents, lightly flecked with brown overall. Tampico - a pattern to pep up the 3-times-a-day routine - to make all your entertaining colorful and different." It goes on to say that Tampico pattern dinnerware is "the life of the party! If dinnerware could dance, Tampico would surely outstep them all! Set your table with this vivacious dinnerware, and suddenly it's a party!" The stemware is "Arlington" (circa 1978) by Viking Glass. What began in 1900 as New Martinsville Glass Manufacturing Company became The Viking Glass Company in 1944. Located in New Martinsville, West Virginia, these two companies were producers of elegant and colorful decorative glass pieces. The company went out of business in 1999. 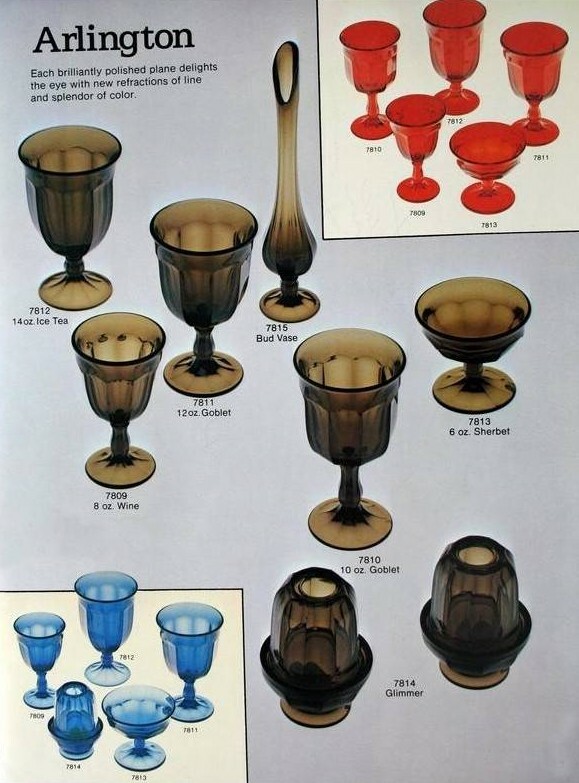 Due to the popularity of their glassware and high sales volumes, much of Viking's output remains available today in stores that sell vintage and antique items (at reasonable prices). Red Wing Potteries introduced their Futura line of dinnerware in 1955 with excitingly modern shapes. Designed by Charles Murphy, the flatware pieces in the line are slightly ovoid rather than round, and the serving pieces are slightly off-center. A Red Wing brochure states of the Futura line that "Red Wing's new shape is modified oval, designed for practicality as well as interest and grace. Plates, bowls and cups are easy to handle, easy to stack, and require minimum table space - ideal for outdoor and buffet service." With fruit and wine bottles in the dinnerware's motif, I thought clusters of grapes might be enough to provide an appropriate centerpiece. Then, I thought I'd insert a few Black-eyed Susans from the garden for additional color. On closer examination, the blooms weren't "centerpiece ready." I found a mixed bouquet at Kroger reduced from $15 to $2.99. Voilà! I poured water in the vegetable bowl before adding the grapes and used the fruit to hold the flower and greenery stems in place. I cut the stems at an angle and inserted them carefully to avoid piercing the skins of the grapes. My favorite time of day for photography is late afternoon, when shadows create interesting effects. Born in Ohio, the Pottery Mecca of the United States, Charles Murphy was destined for a career in ceramics. When Charles was a child, his father was employed by Saxon Potteries, who also gave the young lad his first job during summers when he was away from school. Young Charles went on to study fine art at the Cleveland Art Institute, working in his spare time at Guy Cowan's pottery studio. His talent gained him a scholarship to study art in Europe, but after his return to the United States during the throes of the Great Depression Murphy was forced to re-enter the field of pottery. During this time he worked alongside such greats in the field as Frederick Rhead of the Homer Laughlin Company. In 1940, Murphy began work for Red Wing Potteries where he remained until the late 1950's, with the exception of a short stint in the military. Later in life, Murphy returned to the fine arts working primarily as a wildlife painter. Red Wing Dinnerware lines had glazes applied by hand via an assembly line structure. In the photo below, women using artists' brushes applied individual strokes to light stencil markings on a piece of dinnerware. The piece was then sent down the line to the next decorator who would apply a different stroke. The more strokes a pattern had the higher Red Wing’s production costs. Tampico was Red Wing's most complicated pattern. It required more brush strokes (150+) than any other. Tampico is a city in the Mexican state of Tamaulipas. Joseph Hergesheimer's 1920s novel Tampico tells a tale of expatriates living in the city. "Tampico" is the title of a 1945 song composed by US artist Gene Roland and produced by jazz musician and conductor Stan Kenton, with lead vocals by June Christy. Roland suggested in his song that the city had become more American than America itself. Director John Huston set the opening scenes of his motion picture epic, The Treasure of the Sierra Madre in Tampico. Jimmy Buffett wrote the song "Tampico Trauma" about experiences in the city. Episode 33 of the television series Maverick is set in the city and titled "Escape to Tampico." The novel "Tampico's Gold" by Elizabeth Braun describes Tampico in poetic detail. Tampico is a popular orange-flavored beverage based in the United States. "Tampico" by Gene Roland and produced by Stan Kenton. The song gave June Christy a top-ten hit in 1945, peaking at #6 on the Billboard charts. Christy later commented to the Jazz Journal International that she had been disappointed that her first recording with Kenton was Tampico, but was fortunate that it was a hit and established her right away. Guaranteed to have you humming along -- enjoy! I hope you enjoyed your visit. Please stop by Susan's Between Naps on the Porch for the inspiring tables of Tablescape Thursday! So very 1950s, we can almost hear Bill Haley and the Comets, the swish of our 'rockabilly' skirts and the squeak of our saddleshoes!! The advertising claims for Red Wing's Tampico china must surely have meant that a purchase was irresistible. After all, making every meal a party is something we might all wish for!! Your tablescape is an ingenious collection of items which reflect the spirit of the age perfectly. Now all we need is big hair, a bootlace tie, a long jacket and a poodle skirt and perhaps you will invite us for dinner!! Love the china and you did a superb job. I think it looks nice on your table! Haven't done one tablescape this whole summer. I will get back into it when I get back to Florida. your neighbor knew to whome he gave this china. Only you can create such a beautiful table with this china. I really had no idea to combine it. But it is amazing, what interesting shapes and servers it has. And it is so gorgeous that you have all those old promotional material. I love that. It's been way over a year since I have visited. Not your fault... I was just away from blogging. Well, you still impress me with your artful photography and of course you sence of design. The brown glassware is the perfect compliment to those dishes, perfect! I always love the back story that you share. @ Bunny Jean's Decor and More! Your neighbor picked the right person to give the dishes to, and if anyone could make them look good, that is you. I really like the grapes mixed in with the flowers. I check Kroger's florist for sale items like that and I have a feeling there are many ahead of me, as they are just not there. I am right there with you about mid-century modern - was never a fan. I love your blog and this elegant and colorful table decoration! Bill, there is nothing you couldn't make look good! I like the two casual tablescapes recently. This pattern is darling and I like the modern look for a change. I bet it grows on you. I think it goes great with your table and chairs. I agree with you, it's not my favorite either but wow, you have made it look great! I think your photography and floral arranging just makes everything look better! The goblets are a perfect match as well...love the brown color. I think that flatware is so pretty too! Bill ... as always, that table is fabulous! I love Red Wing ... don't have much, but your collection is beautiful. Thanks for sharing. Hmm, not my pick either, but you did a great job with it. It is different! You and that blasted Kroger store....I'll get you my pretties!!!!! Bwahahahahahaha!!! How do you FIND this stuff, man??!?!? Flowers marked down lower than low, stemware that fits perfectly with the mid-century dishware...and the flatware you chose is perfect with the whole ensemble. You just have the eye of the tiger when it comes to shopping! Or is that Charlie Sheen's tiger blood? I'm not sure. At any rate, you did a fantastic job of breathing life into dishware that by itself would not be all that fascinating. (I'm with you...mid-century is not my thing, and it takes a lot of work to make it into something as you have deftly demonstrated here!) I love it that you occasionally post the promotional ads for the items used on your table! That makes it that much more fun!!! Excellent job, Senor Bill! Have a great week!!! Hello Bill...This table is actually very dear, not to mention festive! I am from Minnesota and my Mother collected this pattern. I always thought it looked so 'space age' with the funky design of the dishes themselves. The dishes look great on your table. Thanks for a fun look at all the pieces, you have very artistic presentations. Hi, Bill! One of my favorite aunts lived in Red Wing, less than a block from the pottery. Every time we went to visit, an afternoon was spent at the pottery seeing all the new patterns and picking out a piece or two to bring back home to Arkansas. No specific pattern, usually a serving piece that caught my mom's eye. That would have been during the late 50s and 60s so I probably saw Tampico. Even then, though, I wouldn't have been drawn to it. I have a thing for dishes with pink roses! I was back in Red Wing just a few years ago. My aunt's house is gone and the pottery is now filled with shops. Lots of the shops have pieces of the wares the pottery made, though. As always, you created a beautiful table, even without pink roses! That was very nice of your neighbour to give you the set as I am sure he knew you would make use of it sometime in a tablescape. I personally don't like it although I do have fresh watermelon in my tablescape today. I prefer more modern simple lines as you know or really nice bone china tea-sets. I love how you have presented it all, the flowers go so well with the water melon and the glasses with the cantaloupe melon. Being a Brit the company names etc.. don't mean much to me but it was lovely to read about the history. Well, I love it...be sure to let us know if you decide to sell it, please!! What a beautiful setting! Your photos are so gorgeous, especially the ones by candlelight. It's always a pleasure and very inspiring to see your settings. Only you could have pulled this one off Bill. (sound of applause) Personally I would have gone with a T.V. tray like they suggested. I do love the old ads though. They are a historical treasure. A very pretty retro table! I love the centerpeice with the grapes. Very clever! The dishes are neat too! Gee I feel so "mid century" being born in 1957!! LOL... that term gives me mixed vibes! I think you did a great job of displaying these. I like the speckled look they gave to the finish...they must have been taken care of very well- they look perfect! The stemware reminded me of some I had by Noritake years ago. You have such fun ideas like adding grapes to your arrangement! I wouldn't have thought of it! Thanks for the music link- I'm a sap for some of that old stuff! Leave it to you to make a somewhat undesirable come alive! You have such a kind heart, you just couldn't say no, right? LOL! You made this very interesting with all the brochure info, etc. Great job! Well, your china was introduced to the world about the same time I was...I think it has held up better:) I can't say it would be my favorite pattern, but you did a beautiful job making it both interesting and beautiful. My mother-in-law loved anything with watermelons, she would have loved this pattern. Outstanding,Bill!...and a gift,well I must say you have truly given a wonderful tribute.As always,everything looks fantastic.I could look at your photo's for hours. acabo de descubrir tu blog y me gusta mucho, si tienes un rato te invito a visitar el mio. i think your table is fabulously fun, love how your have the print outs too. What a wonderful gift from a friend that was moving. All the research you did sure makes it a pleasant and fun read for us. I really enjoyed everything. Love the dishes, glasses and flatware..and your centerpiece is wonderful. As always, your photographs are outstanding. I always look and read, then comment, and then go back for a second time, always catching things I missed the first time around. Bill I love your dinnerware it is very cool!! You have paired it up beautifully. So good to see your design aesthetic. Also wouldn't hesitate to bring out the rosy pinks. That would give a whole new look especially for brunch or luncheons! Bill, Thanks so much for visiting and leaving a sweet comment. Appreciate it. You have stepped up to the plate and made a beautiful table despite your misgivings about the dinnerware. I love the stemware; it coordinates nicely. You have reminded me of a set of pottery/ironstone that I have not yet used in a tablescape - its pattern is similar to yours in that it's food themed but mine is new, not old...thrift find, never used. I also have several other dishes I haven't used in a tablescape yet. I was excited when my mom gifted me with an estate sale find of some Haviland Limoges china that appears (by backstamp) to be circa 1900. Your table is lovely as always! What a design talent you have! Have a great wknd! Bill, I know you are planning a little getaway. When you return, if the votives are missing please know that they are very happy in Savannah. They are awesome and I have been admiring them for some time. After reading about them I knew they were not readily available. I found something similar but not as breathtaking as these. Love the pic in which the votive looks purple. I really did look at the rest of the tablescape. The brown stemware was perfect for this dinnerware. Looks better than what was in the ad. You did an awesome job of presenting something that is not your favorite. You passed the true test of an professional. I am gaga over the coffee pot that matches the set. It is fabulous. A very beautiful tablescape perfectly executed and photographed. Thanks for your visit. I am always honored by your visits. Your Tablescape is Gorgeous as always !! You have a eye for Beauty Bill in all your Gorgeous tables, and your dinnerware is so beautiful. the way you do your ceterpiece is so lovely.I would like to thank you so much for your sweet comments on my new Tablescape for my friend Melanie~~ and your pray's. I hope you have a great weekend with your family. Whether this is your style of dishes or not, you certainly know what to do! Your table is lovely! The dishes are so fun and yet you manage to make your table look so lovely! The stemware is pretty! Thank you so much for poppint in to see me and I hope you have a great holiday too. It's always fun to visit you Bill and this week was really fun because I love that song! Thanks for a great post and fabulous ideas! I must get my hands on some of those pressed glass votive holders! Beautiful! As is everything else on your tablescape. I especially love your idea of using grapes in the centerpiece with the flowers. Genius! I look at your photos of your tablescapes and *sigh*. Thanks for sharing! Your tables are always so elegantly dressed. I too, agree with you regarding this pattern. It's not my cup of tea either, however a gift is always appreciated. You have a great eye for design and finding the bargains. Thank you for sharing yet, another one of Bill's creations. This is such a fun table Bill. I adore how the flower arrangement reflects the colors in those fun plates. You did another great job with this. It is so festive!